Cycling Scotland understands that cycling is truly a cross-cutting benefit, and, as such, keeps a lookout for relevant consultations or calls for evidence regardless of the sector it falls in. 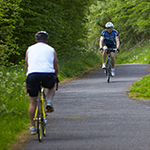 Cycling Scotland supports and works to achieve the Scottish Government’s Cycling Action Plan for Scotland (CAPS) vison of 10% of everyday journeys to be cycle journeys by 2020. Our policy work is comprehensive and covers a range of policy areas including air quality, climate change and the environment; safety and attitudes to people cycling; behaviour change; planning and placemaking; and transport. We regularly reply to consultations across these areas to advocate for cycling (and active travel) to be considered in these policy areas, and across all relevant policies.